The right fit in competitive swimwear is critical to your overall performance. When you are on a swim team or swim competitively, you have to worry about more than your swimming abilities. The fit of your competitive swimwear plays a large role in how well you swim. You need to ensure your swimsuit is one that does not restrict your movement but also allows for the least amount of resistance from the water. A swimsuit that is too tight will make you uncomfortable and restrict your movements, while a suit that is too loose will slow you down in the water. Your competitive swimwear should have more coverage than the standard swimsuit you’d wear to the beach to allow for fluid movement in the water. Taking the time to find the proper fitting swimsuit will allow you to show off your best swimming abilities. You want your competitive swimwear to fit like a glove. It should be tight, but not so tight you cannot breathe or perform your motions easily. There should not be any loose areas that sag or pucker or any type of pulling on the seams. When you try the swimsuit on, stretch like you would in the water to ensure there is no pulling in the openings at the neck or legs. You want your competitive swimwear to be comfortably tight without cutting off your circulation and making it difficult to breathe. The leg openings should fit comfortably around your legs. They should not be too tight so they restrict your leg movements or dig into your legs, causing you discomfort while you swim. The leg openings should also not be too loose so water can get up into the openings because this will slow you down. The straps should stay in the same position during all swim strokes. When you try the swimsuit on, move your arms in various swimming motions; the straps should stay in the same position, no matter how you move your arms. You should ensure the straps are not too loose because not only would they become a distraction, they will slow down your swimming times. 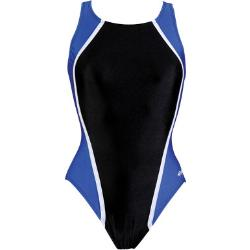 The competitive swimwear you choose should have ample coverage in the chest area. You don’t want it to completely flatten your chest, but you need proper support in that area to allow for fluid movement. Look for swimsuits with adjustable straps to ensure the perfect fit in the chest area.